UPDATE The Neusner reference I give below is from a periodical called New Testament Studies that comes out several times a year. You could embark upon Neusner by reading the extensive extracts in Joseph Ratzinger's Jesus of Nazareth and following up the Bibliography reference Ratzinger gives. Ratzinger and Neusner are close friends and Neusner often defended Ratzinger on the occasions when the wolf-pack attacked him. 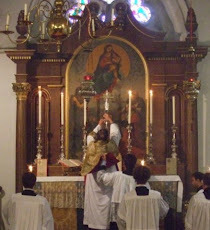 The central purpose of the Mass ... even before the 'Supper' aspect ... is sacrifice. Do you feel any little doubts lurking on the outskirts of your mind about this proposition? Doubt 1: Why did S Paul call the Eucharist the Lord's Supper (kyriakon deipnon)? But deipnon, Supper, is, surprisingly to us, sacrificial language. In the Greco-Roman world, sacrifice was a communal activity. After the animal was killed and the prescribed portions sacrificially burned, the rest was cooked and eaten by the worshippers in a supper which was not just a sequel but was an integral part of the sacrificial ritual (what the Jews called a Communion Sacrifice). Many such invitations have come to light in the rubbish dumps of ancient Egypt, preserved by the dryness of the desert sand. A typical example is 'An invitation to you from Nilos to have deipnon in the dining room of the Kyrios Serapis in the Serapeum' (POxy 2592; late first century). That is why so many excavated temple complexes have dining rooms and extensive kitchen areas attached to them; although sometimes the sacrificial banquet happened, like Christian Eucharist, in a private home (when this happened, the phrase in the papyri is en tei idiai oikiai). And it is one reason why S Paul is so concerned about his Corinthian converts partaking "in the tables of demons". To do so is to share in the pagan sacrifice. Look at I Cor 10:14-22 and note the parallelism the Saint draws between pagan sacificial banquets and the sacrificial banquet which is the Eucharist. Kyriakon deipnon certainly did not, as liberals like to assume, mean some informal sort of matey event ("an expression of fellowship") or a plate in front of the television during Channel Four News. Doubt 2: Did Jesus really have the Holy Sacrifice of the Mass and its sacrificial theology in mind when he sat at table with his disciples hours before his death? Jacob Neusner? Who's he? He's a very distinguished and learned rabbi and academic expert on first century Judaism and Christian origins. Oh yes? So why didn't I hear about him when I was doing New Testament Studies? Because his researches often give strong support to the Catholic and Orthodox Faith from an academic, non-Christian, Jewish standpoint. Your mentors, careful men, naturally wanted to spare you such explosive material, and anyway they were far too busy teaching you about the Synoptic Problem, the Historical Jesus, the non-physical nature of the Resurrection, and the inauthenticity of most of S Paul's letters. But you can't expect me to take seriously what a Jewish scholar thinks about Jesus. I don't see why not. Pope Benedict did. In the first volume of his Jesus of Nazareth, the entire section on the Sermon on the Mount was indebted to an analysis by Neusner. And Neusner, in another brilliantly argued piece, shows that the reason why our Lord 'cleansed' the Temple on the first Palm Sunday was to denote the termination of the Jewish sacrificial system (particularly the offering of the tamid lamb, morning and evening, for the People; their Temple taxes, paid in Temple shekels acquired from the money-changers, went to provide the lambs) because he purposed, on Maundy Thursday, to replace it with his own sacrifice of the Eucharist: Table in place of Table, Sacrifice in place of Sacrifice. If it's good enough for Neusner it's good enough for me. Thank you for bringing Jacob Neusner to my attention. My mentors did indeed spend their time upon the matters you mention.Where would be the best place to begin reading Neusner,can you make a suggestion? Brilliant Father.Please let us know what medication you are taking so we may all share. My only concern is that you are watching Chanel 4 News,the Refugium of Remainers,Clintonites and the sad, moaning remnant of the Liberal Democrats.I appreciate your courage in scoping out enemy territory...as we hairy men used to say:"Time spent in reconnaissance is seldom time wasted." Be careful,Father,for the enemy is subtle and his creepy tentacles will curl carefully around you as you slumber in your chair after another taxing day parsing.We need you! Brilliant Father! The epigraphic evidence is fascinating. Do we know if there was a semantic shift in deipnon? My Liddell-Scott has "the principal meal of the day", etc. in Homer, in old Attic "the midday or afternoon meal". And yet I see further down deipnophoros = "carrying meat offerings" in Plutarch. Where could I get a copy of that book? A search on Amazon doesn't seem to turn up a volume with that exact title. If you have the time, would you mind posting a link? Many thanks, Father! Father, I see that Jacob Neusner is a prolific author. Which of his books would you recommend on this topic? Are there books of his you would suggest on any other topics worth reading about? Sure helped me Father, thanks! If I might stick my nose in here.... I was so impressed with Ratzinger's dialogue with Neusner in 'Jesus of Nazareth' that I bought the book from which R so extensively quoted: 'A Rabbi Talks with Jesus', MacGill-Queen's University Press, 2001, isbn 0-7735-2046-5. Warmly recommended. NOTICE: No Comments on this Blog. Bad King Tudor ... or good? "In communion with the Pope"